In a larger sense, this verse captures the essence of the entire outlook of our department. Jesus Christ before all else, and all aspects of life unified in Christ. As scientists and mathematicians, we understand that His hand is “holding together” the very stuff of the physical universe. Our goal as a department is to explore our mandate to be stewards of creation. Specifically, we strive to recognize the hand of God in the logic of mathematics and in the intricate details of matter. The closer you look at what God has made, the more wonderful we find it to be. 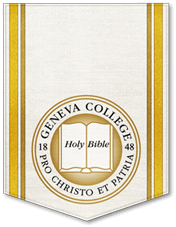 The Geneva College Chemistry Department exists to serve, educate, and mentor students in the disciplines of Biochemistry and Chemistry. We seek for our students to develop a solid competence in the fundamentals of chemistry as defined by the guidelines for an approved program of the American Chemical Society. We also desire to instill an enthusiasm for the process of discovery and research and an awareness of the tremendous responsibility and the sense of awe that comes with understanding and managing the material aspect of God’s creation. The mission of the physics program is to provide students with a thorough introduction to the basic theoretical and experimental methods of physics. We seek to develop their ability to engage in critical thinking, to formulate and solve problems, and to communicate clearly and effectively. Our goal is that they would appreciate the complexity and simplicity of the natural world, awe at its Creator, and be prepared for a life of service for His kingdom and glory. The mission of the Applied Mathematics program is to train our students in the knowledge and skills commonly used in the field of mathematics. We believe that God has spoken his Creation in the language of mathematics: that is, mathematics is consistently embedded in all of Creation. Thus, to study God's Creation, one needs a strong understanding of mathematics. The student is expected to obtain a working knowledge of these skills needed to understand the Creation.